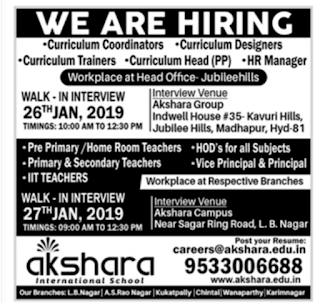 Akshara International School,has advertised for the recruitment of Teaching Faculty- Pre Primary Teachers,Principals,Vice Principals jobs vacancies. 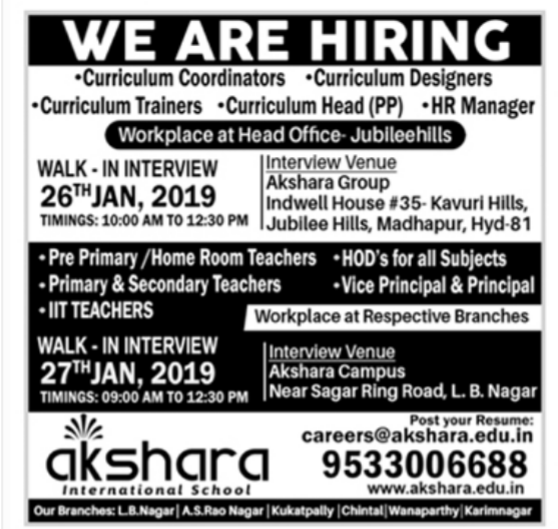 Interested and eligible job aspirants are requested to walk-in 26th ,27th January 2019.Check out further more details below. About School:Our Akshara International School in Hyderabad has achieved the credentials of been the best CBSE School in Hyderabad by our outstanding teaching and management team. We’ve been making lives better by producing leaders of society and equipping our pupil with leadership qualities so they can serve our communities at every level. We continuously endeavor to create a place where the best researchers and most promising students can achieve their full potential. How to Apply: Resume to be email concerned given id. Akshara Group,Indwell house #35Kavuri hills, Jubilee hills,Madhapur,Hyderabad.